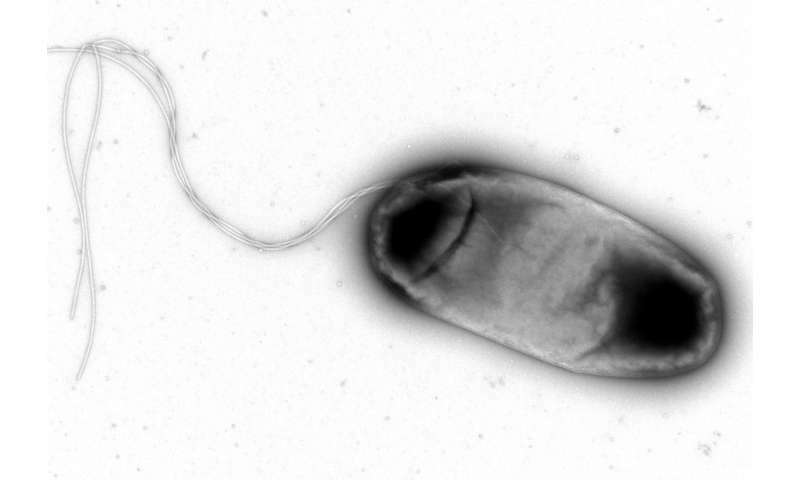 E. coli bacterium visualized by electron microscopy. Credit: Electron Microscopy Unit, IGC. Antibiotics and the immune system are the two forces that cope with bacterial infections. Now, two studies from Isabel Gordo's laboratory, at Instituto Gulbenkian de Ciência (IGC, Portugal), show for the first time that resistance to antibiotics and to the immune system is interconnected in bacteria. The researchers further discovered that bacteria adaptation to the immune system influences the spectrum of antibiotic resistance and, as a side effect, bacteria become more resistant to some antibiotics, but also more sensitive to other classes of antibiotics. These results were now published in the scientific journals Antimicrobial Agents and Chemotherapy and Evolutionary Applications. Bacterial infection requires an effective answer from the immune system. Macrophages are the immune cells that first respond to bacterial infection, by recognizing, engulfing and killing microorganisms. Paulo Durão and colleagues, at Isabel Gordo's laboratory, investigated the ability of bacteria that are resistant to several antibiotics to survive in the presence of macrophages. For this study, they used Escherichia coli bacteria with mutations that confer resistance to two antibiotics, rifampin and streptomycin, which are common in pathogenic bacteria. The researchers observed that these bacteria could survive better inside macrophages than non-resistant bacteria. Paulo Durão: "In our experiments there are no antibiotics present and still, in the harsh environment found inside macrophages, the E. coli strains which have antibiotic resistance seem to be fitter than the susceptible strain. This means that antibiotic treatment selects for antibiotic resistance and simultaneously selects for a higher resistance to the innate immune system." At the same time, other team members of Gordo's Laboratory investigated the other side of the question: what happens when bacteria become resistant to the immune system? Ricardo Ramiro, first author of this study, conducted a series of experiments, forcing bacteria to evolve in the presence of macrophages. This resulted in bacteria capable of surviving better inside macrophages. Ramiro and colleagues discovered that these bacteria, initially without any resistance to antibiotics, became more resistant to a specific class of antibiotics, the aminoglycosides, and more sensitive to other classes of antibiotics. "This side effect of bacterial adaptation to the immune system could be used in our favor to better select antibiotics for treatment of infections", says Ricardo Ramiro. "While adapting to the immune system, bacteria become more sensitive to some antibiotic classes. Thus, using those antibiotic classes for treatment of infections, should allow for a faster cure of the infection while minimizing the emergence of antibiotic resistant bacteria." Isabel Gordo adds: "Our results with E. coli set the ground for future experiments in other important bacterial species, such as M. tuberculosis and Salmonella." Bacterial resistance to antibiotics has been increasing, posing a serious threat to human health. Understanding the relation between bacteria, immune system and antibiotics can open new avenues to cope with such public health problem.